The Jura Niederlaufhund is one of four varieties of Small Swiss Hounds, the other three being the Berner, Luzerner, and Schwyzer. 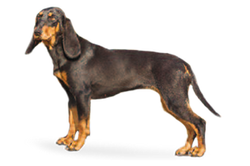 The title ‘Niederlaufhund’ means ‘short-legged scenthound’, and due to their size they are sometimes referred to as dachbrackes or bassets. Each variety specializes in its own hunting grounds, the Jura being used to track small game over difficult terrain. All of the Small Swiss Hounds were the result of specialized breeding programs to reduce the size of their larger cousins. In the early 20th century a new system of hunting preserves was created in different parts of Switzerland that reduced the size of their hunting grounds. The larger dogs were deemed too fast for this type of hunting and so in an effort to “improve” the hunt their legs were gradually shortened. The Jura Niederlaufhund is most commonly found in the Alpine region north-west of Switzerland that shares its name. Is the Jura Niederlaufhund Right for You?